﻿ Experts in supplying secure IT and surveillance for the police, military, local government and business. 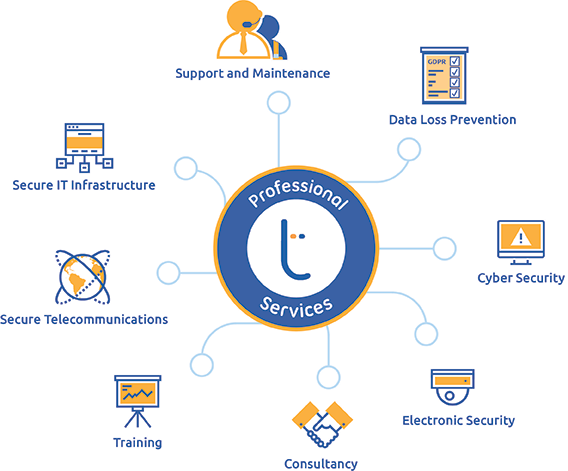 Tellemachus are trusted Technology and Security Specialists and a Managed Security Service Provider (MSSP), delivering risk reducing and innovative solutions across Data Loss Prevention (DLP), GDPR Compliance, Cyber Security, IT Network Infrastructure, Telecommunications, and Electronic Security. For over 23 years we have been trusted to provide UK Government, Police Forces, Military Agencies and Blue Chip Companies with Secure IT Communications, Security Projects and 24/7 Support. Our quality certified professional services are provided by a highly skilled team who Listen, Demystify, Innovate, Deliver and Support both routine and niche customer requirements. Tellemachus have provided a state of the art 53 camera County Wide CCTV and Evidence Management System for Cumbria Constabulary. The systems covers the geographically dispersed towns of Carlisle, Workington, Whitehaven, Barrow, Kendal and Penrith and is monitored within the Operations Centre at the force HQ in Penrith. In order to provide Senior Directors, Business Owners and technical staff with more clarity on what is important within the new GDPR legislation, we are running a series of webinars to provide more information on possible actions you may need to take, in order to comply and avoid severe fines.